Let me start by saying this is no way an endorsement of the rather classless things UK boxer Dereck Chisora did to Vitali Klitschko before their WBC Heavyweight Championship fight on Saturday. First, at the weigh-in Chisora slapped Klitschko right across the face, which started a small tussle that really didn’t go anywhere because of Vitali’s completely ice cold murderer stoicism. Almost anyone caught up with what’s went on in the boxing world for the last four years or so seemed to indicate this meant Chisora had a deathwish. If that wasn’t bad enough, as the match was approaching the opening bell, Chisora took the opportunity to get nose-to-nose with Vitali’s brother Wladimir (aka, #2 pound-for-pound boxer in the world, and reigning IBF, WBO, and IBO Heavyweight Champion) and then be so kind as to spit water in his face. This incident again was snuffed out by the eerie Ukrainian stoicism Wladimir responded with, but pushed the fight to must-see levels of interest. The Klitschko brothers, despite their good reputations and class, are a large reason why boxing just isn’t connecting with American audiences anymore. Since the four major titles in the boxing world are split among the two of them, the only way to unify the belt would be if they faced each other, something they have repeatedly said they will never do. A unified belt draws a singular focus to the boxing world, and one single name to attach the idea of “best in the world” to. Explaining that to say, the casual UFC fan, isn’t going to get them to check out a fight. So until someone can beat either of these two, specifically Vitali since he only has one belt, there’s no chance of that happening. Then there is the frustration that comes from their being smart fighters. While normally one of their best qualities, the size and power of both Klitschko brothers should be their biggest advantage. They never simply go for the kill against larger opponents. 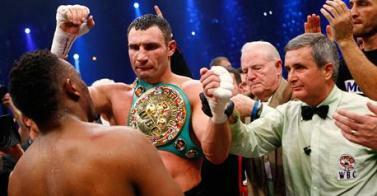 Wladimir’s last first round knockout was in 2003. Vitali knocked out relative unknown Odlainer Solis quick last year, but prior to that went ten years between his last, and found most of his knockouts later in fights. The size of the two makes you want to see an absolute obliteration each bout. Instead they work smart and take their time. Reducing mistakes, wearing the opponent out, and doing it how it is supposed to be done. Again, normally great qualities, but doesn’t exactly make for a huge deal here in the U.S.
That’s where Chisora comes in. The foil to the Klitscko brothers, slapping his opponent and spitting water in the face of his opponent’s brother before a fight. Trying to break the Ukrainian’s focus and force him into fighting angry. To his credit, while most of us would be terrified of the consequences associated with these deeds, Chisora never blinked. He wanted to shock the world, or die trying. He did more than many expected, going deep into the bout with an aggressive approach against an angered opponent. Finally, a bad guy to match up with Dr. Ironfist (Vitali is the first boxing champion to also hold a doctorate, by the way.) The German crowd who was firmly against him began to stir, perhaps wondering if they would see a Klitschko fall. Chisora ended up lasting all 12 rounds with Klitschko, but losing a unanimous decision. After the fight, Chisora accepted his defeat, but remained defiant to critics who expected to see him get what was coming. Vitali seemed content with victory, though he definitely knew he was in a fight. The end of the fight would not stop the drama, as during Chisora’s post-fight press conference, he was confronted by former WBA champion David Haye. This lead to a huge brawl between Chisora, Haye, and their respective entourages. Chisora had allegedly made remarks concering Haye’s 2011 loss against Wladimir Klitschko where he was completely dominated. Haye, who is technically retired, had claimed he would have taken care of Vitali before it went to the judges. Dereck Chisora has some options. Whether or not his antics, or even post fight scrap were publicity stunts, I say they worked. I want to know who he’ll fight next. Match against Wladimir? Rematch with Vitali? Or straight up grudge match with David Haye? I say it doesn’t matter. I should mention here I’m not that big a fan of boxing in general, but I want to see his next few fights. Either he’ll pull off something ridiculous, or get what’s been coming to him for a long time. This very professional wrestling-like happenstance to a legit sport could be just what it needs to recapture the public’s imagination. Every story needs a villain and the story of the Klitschko brothers is a story that finally has one.